I have been having a real tough time lately. My partber and i are going through a very rocky patch,and we are on the verge of breaking up. To cut a long story short, i found he had been taljing explicitly to other girls for at least the 5th time recently. We are going to be going to relationship counselling within the next couple of weeks to try to sort ourselves out. Also , my mum is dying. She probably only has a few months left at best. The cancer has finally caught up , and shes getting weak. I havent always got on with my mum, but she is still my mum at the end of the day, and it does upset me. You are probably wondering what this has to do with lily. Basically, i havent had the physical strengh or mental strength to deal with anyone or anything at the moment, including my son and lily. I have been watching her tonight, and she just seems so down and depressed, walking around with her tail between her legs. And now i feel so terrible for letting things get like this, for neglecting her to the point that she is depressed too. Why am i posting this here? I really dont know. I suppose i just need to vent and you guys have been so supportive in the past. Anyway, im gonna leave it at that. Thanks for reading and putting up with my self pity. I've never been so down that I couldn't put on my happy face for my pets. Poor you, things must be very tough indeed. Can't Alfie spend some time with his other grandma, so that you have some time to yourself to process everything? He could stay over for the weekend or a little longer? I am so sorry to hear this Becki I really do hope things get better for you and Rob, at least...I wish for you Mum too, but I know that it may not be as easy there...We're all here for you and venting is definitely ok. In the end, we're all people with our own trials in life. 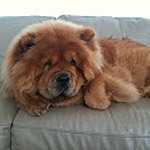 It's not just the love of chows we have in common. I know it's rough...but perhaps pushing yourself to take Lily and Alfie for a walk will help clear your head and relieve some stress. It really does help once you drag yourself out of the house (for me anyways). I kind of manage to clear my mind and not think of much else when I go on walks with Ty and it didn't occur to me until Brian (my fiance) asked me if on my walk I thought of what we were going to have for dinner as he asked me to give him some options when I came back. I then realized that no, I did not and come to think of it...didn't think of much else either! I was in the moment of the walk. I wish I lived across the pond to help you out or at least take a walk with you guys to get your mind off of things or just hang out and talk art/chows. But alas, I do not. I'll give my best from where I am. Virtual hugs and purple kisses! 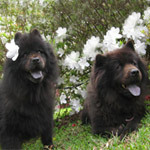 Pets have ESP, particularly chows. They sense whats going on around them and replicate your mood to some degree. Lily is feeling what you are. I agree with Ty, Lily is there to help you through your time. 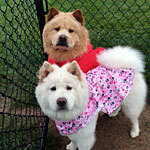 Walks to take the edge off or just a nice petting session would be therapeutic for both of you. Please pardon my sticking my neck out here. Just wanna say that I can feel what you are going through since I had been in such a situation thrice (with the same man) but then my dog (Cookie Dalmatian) helped me to get a level headed thinking. I just watched her play around while my heart bled. It helped clear my mind - but u know Dals loved to clown around. 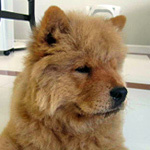 While a chow loved to lie down beside your feet. I thought it ironic. i had that dal puppy to cheer me up when he broke my heart firstly, also had that dog when we separated first as husband and wife. Now my fav dog is gone (Cookie died 4days after I left) and "my" relationship WHICH Cookie has seen is also ended and I think for good coz I believed I did everything to keep a family intact but when your partner plays around... You gotta be an idiot to be happy about it when you find out. Being angry is normal. It also helped tremendously that I believed in God, Him knowing I was not the one breaking my vow or promise. You must be strong for your son , your lily , yourself and for your relationship. I sincerely hope you and hubby will get through the rough patch. Love isn't always rosy. It has its thorns. Be kind. So long as both of you recognizes your mistakes and willing to make it through the finish line (old age) I think Never say Die attitude along with God's grace will pull you through. And Lily will be happy too. And son also. my friend said in a poem: Plant your own garden, instead of waiting for someone to bring you flowers. sorry to hear you are having a multitude of things to deal with...you are not the first on this site to have such things to handle - we are here for you. Hi Becki, I am so sorry to hear about your Mum, I can really empathise as I am going through exactly the same thing with my Mum. My Mum has been fighting a reare cancer for 7 years now, she has been so brave and so strong and defied the odds. In November she was told she only had a few months left and also has cecaxia too. I now live in Canada, my Mummy is in Lincoln, England, for 7 years I have been dreading the phone call 'Mum's gone'. We went back at Christmas for Mum's last Christmas, we've had Mum's last Birthday and now it's Mum's last Mothers Day, it's all so awful, she's only 61 - I bed anyone reading this, Please give up smoking, please! My Husband has also let me down with a house purchase, we now have two mortgages and he has lost interest in renovating the new house so we can actually move, he has been diagnosed as having SAD. My daughter is struggling in school. My daughter and I are seeing a counselor right now which is helping. One thing I really love is my morning walk before the day starts with Henry, 30 minutes of only worrying about Henry and picking up his poop. I get my thoughts together and get strong enough for the day ahead, I even sob my heart out some times - good job it's winter, there is hardly anyone around, but frozen tears doesn't do your skin much good that's for sure lol. Becki don't be afraid to go to the Doctors and explain whats going on, sometimes a little medication is required to get us through lifes trauma's, sometimes just talking to virtual friends also helps, don't be afraid to say what you really feel right now either, it's OK to be angry at your Mum for leaving you, I know I'm angry at my Mum. Your doing the right thing with couples counseling - if that is what you want - don't be pushed into things you don't want. These days with all this internet and facebook stuff, it is so easy for 'people' to get caught up in a virtual world and get confused with what is actually happening around them in the real world, having a teen girl with facebook, we can certainly tell when there is facebook drama going on. I have looked online for cancer support groups for people that are not carers or sufferers but there doesn't seem to be any for family members that can't actually do anything. Becki, I am sending you the biggest hug ever and all the support I possibly can. Keep strong, keep tough and don't let the B*****ds keep you down, your made of tough stuff and you WILL I promise get though this extremely awful time and come out the other end OK, it's just really crap while your going though it. bless you Lorraine. Thank you. My mum is only 45, so she is very unlucky to have this condition. At the moment, it's in her brain, liver, spine, other bones, liver, mouth, lungs. It's really taking over. She's still having chemo, which slows it down, but isn't doing much else. I am already on tablets for depression, have been for nearly 2 years now, and it does help. My doctor is very good, and understanding. There is a cancer support group for peope who have been affected by cancer, they don't have to be suffering themselves. Macmillan Cancer supprot has a whole support forum. I used to be a member, but it never really helped me much, but it may help you. Becki you don't have to apologize for reaching out for support, what you are going through is tough. I lost my Mom to cancer as well many years ago when I was 25 (she was 59). It is an awful disease and an awful thing to watch someone you love go through what it does to them. I know dogs sense what is going on around them and Lily is probably picking up on the tension. 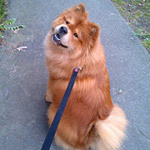 You mentioned that Lily was in heat right now, that could be part of the reason that she seems down, hormones can do that to dogs as well as people. Becki, I am sorry to hear of your troubles. I too can identify with some of your problems. I have found that my two were very supportive of me, and actually tried to cheer me up. I found it comforting to just sit on the floor with them. Why don't you and Lilly try that some time. 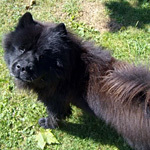 Take a brush and groom and pet her, and see if she can offer you some comfort. Just wanted to say I'm sorry to hear you are having a tough time. Be kind to yourself, and know that you are not alone in your struggles. I don't have any words of wisdom just wanted to say I'm thinking of you and hope things look brighter for you sooner rather than later. My heart goes out to you. I have walked some in your shoes so I know some of what you are going through and dealing with. I lost my mom when she was 52 to brain cancer. I was 28. We didn't always get along or see eye to eye - my Dad said that was because we were so much alike. It's been 34 years and I still miss her. I smypathize regarding you and your partner. I've gone through a similiar situation. Talk about being heart-wrenching, going into a tailspin and a downward spiral. My husband and I met when we were 13, married at 21 and after 25 years of marriage he decided to "come out of the closet" after I questioned him about his phone calls from "male" friends and some "love letters" (from a male friend) I had come across while cleaning. He decided he'd rather be with his gay friends than be a husband and father. Talk about having the wind blown out of your sails. I was a basket case for a while. At times like that we do silly things. Here's one that I did. There were times I felt like crying but didn't want my young daughter to see or hear me. - I'd gather up some dirty laundry and go to the basement and sit beside the washer and cry my eyes out while the washer was running. Luckily for me during this dark time in my life I rescued my beloved Chloe, yet I know and feel she was the one who rescued me. Lily can be your rescuer. She needs you as much as you need her. Even if she's not up to walking much, you can talk to her, pour your heart out to her or just sit quietly and pet or groom her. It will do both of you some good. If you need to talk or just rant - please come here, you are among friends who care and understand. Please try to take care of yourself. Try a little pampering of yourself - how about a calming bubblebath or go-o-d chocolate? Hi becki, Just checking in to see how your doing, just wanted to let you know I'm still thinking about you! Bless you all. Thank you so much. Sorry I haven't been replying, been a busy week. The weaher has been so nice, haven't been in much. Plus I haven't had a phone, and I normally come on here on my mobile, so I haven't been on much. I'm doing good. Things are actually good between Rob (my partner) and I, since finding out what he has been up to, it just feels like a huge weight has been lifted off of my shoulders. It is more relief than anything else. I know I am a mug for letting him get away with it, but I wouldn't manage by myself. Lily is doing great. Her leg seems to be doing OK, I have been taking her out on short walks twice a day and she seems to be getting her strength back in it. I have also been spending lots of time with her and it is doing me good. My neighbor p###ed me off the other day. We have low fences, and they said that Lily was trying to get over to attack them, which I know is a load of rubbish. She is the gentlest, kindest, sweetest dog I have ever known and doesn't have a nasty bone in her body. They just want to get the fence raised. Well, I'm not paying for it! Soo pleased to hear things are improving. It always passes, eventually. It is a lovely time of year here in Australia too, being Autumn it's a perfect temperature. I'm so glad Lily's leg is on the mend and you're both able to get out and about. As for your partner, sometimes it's better the devil you know! I often find myself saying the same thing to myself. Anyway glad you're feeling a bit better. Lily is just beautiful. I'm glad things are better for you too.